Rationale for reading: I have not read much on persuasion or sales. I thought this would help keep my training clientele accountable. Recommendation from Zach Moore. Book summary: To influence others and to avoid being influenced when undesired, understand the psychological principles of reciprocation, commitment, consistency, social proof, liking, authority, and scarcity. Review summary: I went suit shopping and saw this book unfold before my very eyes. Suggested audience: Anyone who interacts with people, especially if you coach them to change their habits. A few days after reading this book I went shopping for a suit. Without luck at the cheap places, my friend and I went to Men’s Wearhouse to browse and were immediately accosted by an attractive sales woman. As she began talking, I saw this book unfold. The idea of this chapter is that if you do someone a favor, they feel obligated to reciprocate it, regardless of whether or not they even like you. Saleswoman Katie went after this right off the bat. I then proceeded to call her out on this tactic, which she performs subconsciously. It’s like it’s in her DNA. Commitment and consistency are obtained when you have a prospect stick around for a longer duration of time. If I’ve committed more time to Katie, I will consistently come back to her for all of my suiting needs. The fact that we were there for hours is one part of it. Another way to get commitment and consistency is by getting me to agree with anything. She could ask if I like the $800 suit that I have on (obviously I do). She could ask if I’m enjoying my suit shopping experience. She could even ask if I am enjoying the nice weather! Getting me to commit in any way will help her chances of closing the sale. Social proof is fascinating to see in action. Like the time my school sent out reports that an unidentified man with a gun was on campus. One person says, “Meh, someone made it up,” and soon nobody thinks it’s a big deal. People just keep walking about. The effect snowballs. In sales, a busy store gives social proof – especially when customers are asking her for advice. This store wasn’t particularly busy at this hour, so Katie was unable to obtain social proof in this way. If I like Katie, I’m more likely to buy from her. So she dresses up, makes me laugh, likes my friend, and matches my level of speech (i.e. she doesn’t swear until I start to swear). Even if what she’s asking of me is uninteresting, I might do it because she’s my friend. Most of this factor is dependent on the individual and your ability to read them. Some people respond to playful joking, and others want you to be a professional. The authority principle is what is in play when your boss asks you to do something. Or the reason you pick the guy with the doctorate over the guy with the master’s degree. With authority comes reassurance. Katie demonstrated her authority by giving advice in a stern tone. “Don’t you ever wear this with any other set of pants. Ever. We record your address and I will hunt you down.” Her strong opinion reinforces to me that she knows what she’s talking about. Plus I feel the need to be obedient because I don’t want to let her down. Everyone in the fitness industry is trying to have authority; there’s a sense of trust that accompanies the tagline “from a NY Times best selling author”. This says nothing about how good of a trainer he or she might actually be, but proving you’re qualified is necessary to reach customers. Scarcity is a principle that must work well because I see it everywhere. With Katie, the sheer fact that there were only three suits in the building that fit my body displays the scarcity of the product. Finding more suits that fit me doesn’t lend well to this principle (then there’s just too many to choose from). Katie mentioned that earlier in the day, she had a guy very close to my size come and wipe out the inventory. Later I find a suit I really like and I get worried that it will be gone if I don’t purchase immediately. However unlikely, it still could happen, and that thought weighs on a consumer’s mind. This principle will be harder to incorporate with clientele in terms of getting them closer to their goals. Selling them on a group who’s signup period will end on a set date and who’s class size is limited will be a good way to make sure a potential client becomes an actual client. Without a signup, I cannot help someone, and buyer competition funnels in those who are more dedicated, giving us the best group possible. So how am I going to use these to help others accomplish their goals? Let’s break it down. Reciprocation: The best avenue I see to engage reciprocity is by putting out free material. Even if it’s my best stuff. 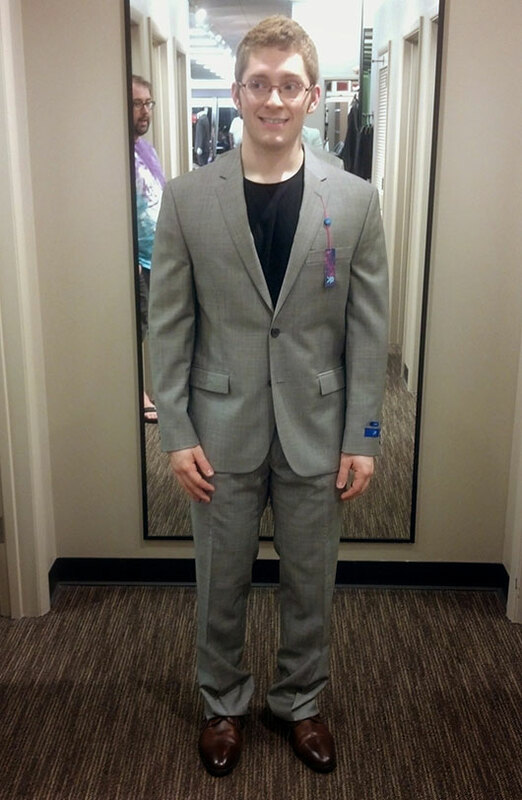 You’re going to try on a suit before you buy it, right? Commitment and Consistency: If you commit to my newsletter, I know that my message is more likely to reach you. I would like as many people on this list because it allows us to form a more personal connection. The site becomes more of an environment than a billboard. Social proof: I want you to know that your friends are here and they like being here. This is the reason that I want the site to be a community; communities stick together and help each other. Liking: I try to be an interesting person – mostly just because then I am more happy. Not everyone will like you, but I’ll be the best me I can be! Authority: Getting results and writing other places will be my next step here. Per the suggestion by an IFAST client, we may be getting shirts that say, “Lance is my boss.” If you want to get on the pre-order list, send me an email (lance@lancegoyke.com). Scarcity: There’s only so much I can get done in my waking hours. If you want to ensure your spot, act now. Putting it off to tomorrow means you’ll never do it. Understand that none of these factors were enough to make me purchase because I was not brought up as a high roller, but I could literally feel the energy in the room changing. I would have never even amused the idea of a $500 suit if left to my own devices. I would say this means Katie wants a better lead than someone like me, but it could speak to the efficacy of the principles presented in the book. Pick up a copy of “Influence” here. AT in the mirror shot is pure gold!